The C6 Fast Charge Amplifier is a dedicated high-end charge amplifier with high gain and low noise, made for high-speed applications. With a rise time of 3.5 ns and a Gaussian pulse shape with 10 ns FWHM, it is optimized for high-speed single MIP particle detection and for fast spectroscopic applications in combination with diamond detectors. It has an integrated Bias-Tee for the direct application of the detector bias voltage. The C6 is the ideal amplifier for high-speed applications. The Gaussian pulse shape with 10 ns FWHM allows to record high repetition rates with excellent double-pulse resolution, in combination with a good energy resolution of ±10 keV for diamond detectors. 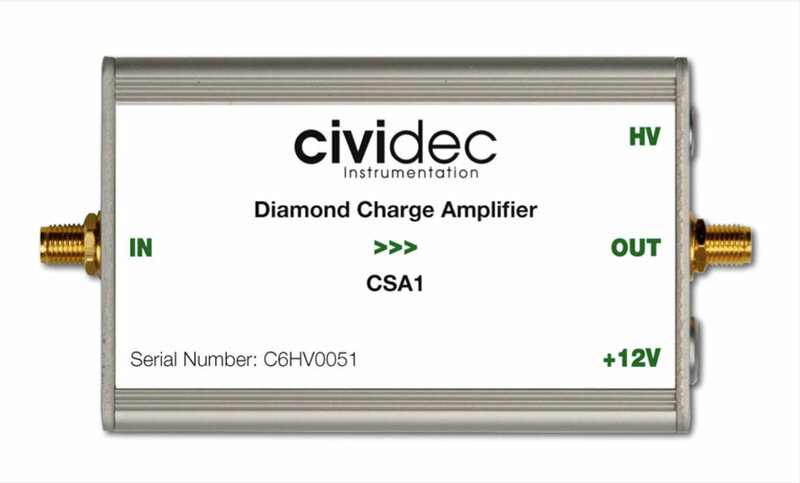 The C6 Fast Charge Amplifier is optimized for the fast input pulses of diamond detectors. The capacitive input load should be below 20 pF. 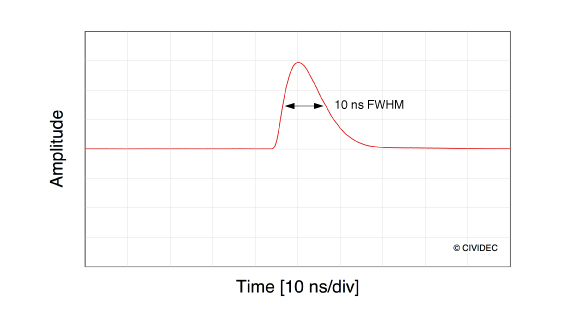 The Gaussian pulse shape can be customized to 6 ns FWHM for fast timing applications. The C6 Fast Charge Amplifier is a unipolar charge amplifier with shaping stage. It is inverting and is operated with negative input and positive output signal polarity. 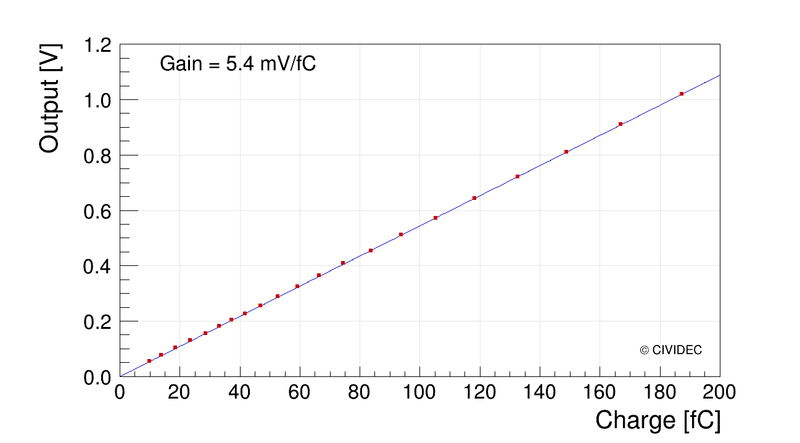 The excellent linearity of the amplifier over the full output range of +1 V is demonstrated in the Figure. The amplifier has a gain of 5.4 mV/fC. The C6 Fast Charge Amplifier is optimized for high-speed single MIP particle detection and for timing applications with diamond detectors. The amplifier is sensitive to the capacitive input load. 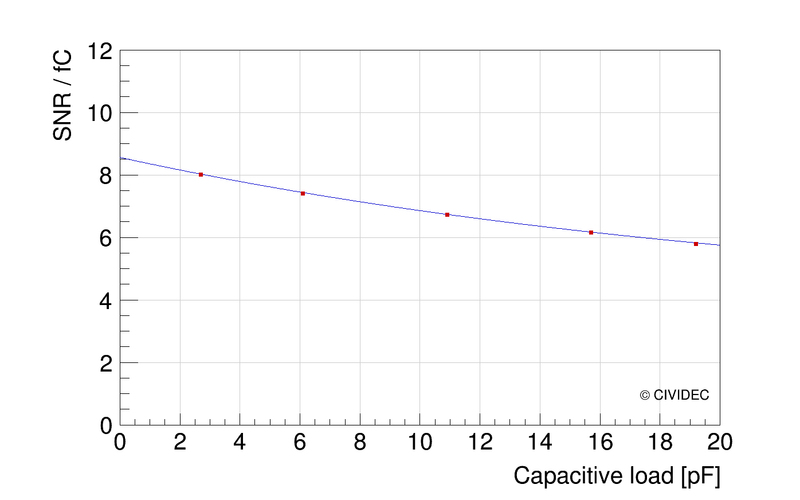 The signal-to-noise ratio (SNR) is decreasing with increasing input capacitance. This amplifier shows best performance for input capacitances below 20 pF.